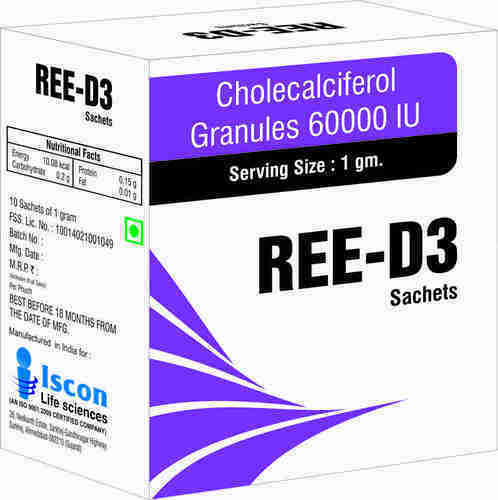 To retain our goodwill in clients' consideration, we are manufacturing an excellent range of Ree D3 Cholecalciferol Granules. Cholecalciferol is used to treat or prevent many conditions caused by a lack of vitamin D, especially conditions of the skin or bones. Known for manufacturing and supplying a wide range of premium quality Health and Skin Care Product, "Iscon Life Sciences", started its operation in the year 2003. The offered product range is inclusive of Antibiotic Drugs, Anti Rheumatoid - Muscle Relaxants and Nutrition Minerals & Vitamins Supplements. Used in various hospitals, nursing homes and health clinics for treatment of various acute and chronic diseases, these pharmaceutical products are processed as per the FDA set norms by using advanced tools and equipment. Known for its effectiveness, enhanced shelf life, quick results and accurate composition, the offered range of pharmaceutical drugs and skin care products is processed from quality assured ingredients. Customer centric approach implemented in our firm, has helped us in catering to the needs of our valuable customers in the most efficient manner. Being a reputed name in this domain, we assure that the premium quality of the offered range is maintained. Aakash Medical, Uttar Pradesh and Ananya Drugs, Agartala are few of our customers associated with us since the inception of our company.